Follow us along the main streets of Valletta on the 29th and 30th September 2018. 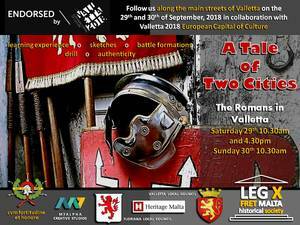 This event will be linking the Romans of the 1st Century AD with Valletta, as part of the events happening in this year’s European Capital of Culture. Starting at 10.00am, Legio X Fretensis Malta will be marching from Floriana and entering Valletta. During the event, Legio X Fretensis Malta shall be announcing and giving information about the group. Along the way, in Republic Street, a scene of Roman religion and other daily life scenes in St. John’s Street, Merchants Street and Freedom Square as it would have happened during Roman times will be performed. At around noon, the group will be marching back to Floriana. The event will include special assigned areas: in front of the Parliament building, in front of The Archaeology Museum, in front of St. John’s Co-Cathedral and back to Republic Street. This event is being organised by the historical representation group Legio X Fretensis Malta which was founded back in 2006. As part of the events the group performs Roman drill, static displays, educational talks and scenes.